Released without much of a promotion, many Eminem fans were surprised by Eminem's Diss'ing intensity in "kill shot", which was targeted at Machine Gun Kelly for his violating remarks on Eminem's only biological daughter Hailie Jade Mathers (born on 25 Dec 1995) to his then wife Kimberly Anne Scott. It all started in 2012, when Machine Gun Kelly tweeted "hot as fu** " referring to Hailie Jade Mathers picture on twitter, Hailie Jade was underage (barely 17) at that time and this tweet infuriated many Eminem fans, even though he deleted the tweet within the next few minutes. This profane tweet of his, resulted in him being banned at some media/entertainment outlets owned by Eminem fans/loyalists, and MGK even claims that the Rap God himself called MGK, to issue a public apology regarding the tweet. and I don't care who got bars." This did not go well with Eminem, who released "Not Alike", early 2018, diss'ing MGK for his collaboration with Tech N9ne, suggesting MGK has not only tarnished Tech N9ne's reputation, but has created bad blood between him and Tech N9ne. What MGK did next not only destroyed his career but also cost him many fans, as he once again dragged Eminem's daughter Hailie Jade Mathers into their Rap Battle. Fu***** dweeb, all you do is read the dictionary and stay inside." 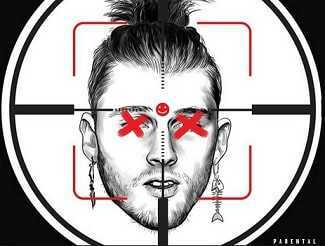 Finally, Eminem released "killshot" on September 14, 2018, a few days after Machine Gun Kelly trashed him on The Breakfast Club. "killshot" has more than 218 million views on YouTube, with 4.3 million likes (as on January 4th 2019). Eminem devoured MGK's "Rap Devil", word by word, dissecting the song from multiple angles, stunning MGK so much, that he accepted defeat, when he said that he will not respond to Eminem's "killshot". The song gained 38 million views on YouTube within 24 hours of it's release, hitting 8 million views in less than 8 hours, which helped the song reach the 3rd spot in the Billboard Hot 100 charts.